City Church, Birmingham (website www.city-church.org.uk) was founded in 1999 in a front room in Edgbaston and has grown amazingly since that date. The church believes that God changes lives and faithfully reaches out with the good news of Jesus whilst helping to build up Christians in their faith. From the late 1990s there has been 5-a-side football played between a group of Christians and non-Christians in the Selly Oak area of south Birmingham. This has been run and organised by a range of people who have played in wmcfl such as Neil Millard, John Wright, Will Wright, Martin Ogbourn and Rob Stokes. After several years of 5-a-side football, friendly 11-a-side games were played against other church sides during 2004-2005. 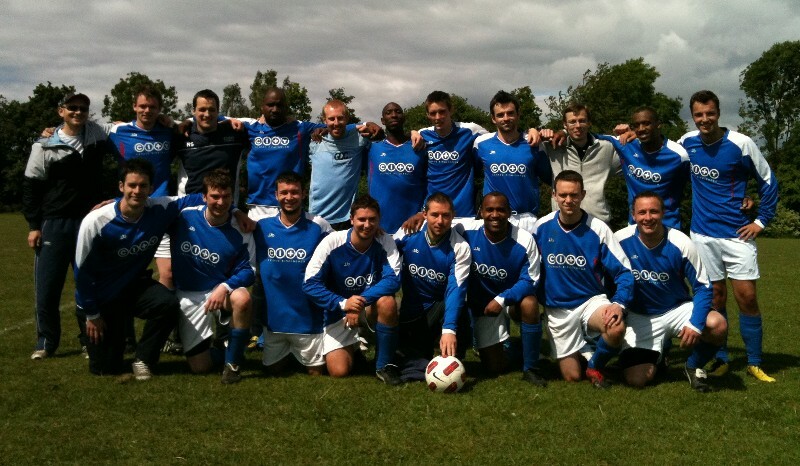 By the start of the 2005-2006 season we decided that we were established enough to enter wmcfl. This has been set up and organised by Dan Hardy, Will Wright and Neil Millard. We look forward to participating in the league for the 2005-2006 season. City’s first season was a mixed affair in which City flirted with promotion and the lower reaches of the league, yet ended up in mid-table in Division Two. There were some good results and a quarter final penalty shoot-out defeat to the league Division One winners, Chawn Hill was one high point. City followed up their first season by winning promotion to Division One in 2007 with only two league defeats. City led the Division for much of the year, but were overtaken towards the end by a Rowley College team on a mission after a title-deciding win late in the season in an epic confrontation. City’s success this year has been largely due to the goal-scoring exploits of the Mckenna brothers and Louis Quaintance who between them managed fifty-three of City's sixty-eight goals. The 2007-2008 season was difficult for City as the promotion side broke up for a number of reasons (including injuries, players moving away and leaving). It took half the season to rebuild the squad. City were competitive in most games and indeed led in a number of fixtures, but narrow defeats and points thrown away for draws meant that City found themselves in a relegation scrap. After January City’s form improved and they finished the season in eighth place in Division One. This meant that City narrowly avoided relegation. The 2008-2009 season saw another improvement as City finished in fifth place and were only one win off third place. There were some notable performances and Dan Atkins and Dave Louden combined well to ensure a goal threat throughout. Daniel Atkins netted twenty-one times in twenty games, second only to Everton Morrison from Clarendon who broke the Division One record. This season was about consolidation in Division One. 2009-2010 was a breakthrough season for City as new additions bedded well with old stalwarts. It ended in a 6-0 Cup final win in front of the Sky Sports cameras at Halesowen Town FC (Faith in Football; Sky Sports News 19/05/2010 on YouTube for evidence!). The Cup win was fully deserved after quarter final and semi final wins over St Marys and Clarendon. There was further progress in the league with a fourth place finish. However, this could have been better as we played for third place again for the second year running on the last day of the season. If 2009 was about consolidation and 2010 was a breakthrough, then 2011 was the pinnacle so far as City won the Division One title after an amazing finale to the season. City were out of contention with six games to go, yet City won the last six games (including beating four of the top six and St Marys and Clarendon in the space of four days) scoring twenty-seven goals in the process. City were the highest scorers in Division One (and only Rockmount in Division Three scored more goals) and won the title in a thrilling finish on the last day of the season by one point after a 5-0 victory. Martin Ogbourn Aug 2012: City had a respectable defence of their title in 2011-12 by finishing second in Division 1. City had some excellent attacking performances and with the exception of two thrillers versus Rowley (conceding a combined 11, yet scoring 11!) defended very well throughout the season. However, inconsistency away from home cost City too many points in the league. In the cup City departed at the quarter final stage on penalties to Chawn Hill. The evergreen Jason Garwood was the club player of the season and Olly Thorp was the most improved player. Dan Atkins was once again top scorer. Ian McDonald Sep 2013: The season of 2012/13 promised much for City and ultimately ended up with a quarter final cup defeat and a third place league finish, despite finishing only two points off the title with a 72% win ratio. Two defeats in five days to Sheldon and Clarendon in mid-May was the turning point, as the massive backlog of fixtures in a weather-affected season caught up with the squad. Overall there were many good displays during the season as we competed at the top of the league throughout again. The biggest wins were an 8-0 cup victory versus Selly Oak, two 7-1s and a 6-0 victory against Rowley.